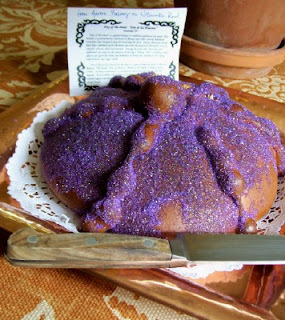 Before I forget, I wanted to show you the "Bread of the Dead" I brought to a meeting for All Saints' Day. I read about the Mexican-style Aurora Bakery in the Scene's Bites blog. Not only did their sweet breads smell divine, Aurora Bakery is locally operated, ultra-clean, and inexpensive. I call that a find! We used to make sugar skulls for All Saints Day/Dias del los Muertos. Your bread is beautiful!